Whether you’re just starting to powder coat or your powder line has been operational for years, you need to have an accurate picture of what’s going on inside your curing oven if you want the best results. Fortunately, there are a number of maintenance and troubleshooting tools available to help get the best finishes possible from your coating equipment. One of these tools is a powder coating oven recorder, also known as an oven data recorder, which can help identify curing problems, increase your throughput, and optimize your oven’s fuel efficiency. When Should I Use A Powder Coating Oven Recorder? When first starting to powder coat, it is a good idea to run an oven data recorder to determine exactly how fast your metal parts reach the proper powder curing temperature. This is important because powder companies formulate their powder to cure with specific metal temperatures and curing cycles in mind. Depending on your market and your customer’s specifications, you may want to run a powder coating oven recorder whenever you add a new type of powder to your process. You may also want to check the oven’s performance if you are working with parts that are much heavier, thinner, larger or smaller than usual, or made of a different material (such as swapping to aluminum from steel). This is especially important if your customer has stringent finish requirements. The primary reason for checking your metal temperatures is to make sure you are not over-baking or under-baking your powder. Over-baking usually refers to curing the powder at higher than recommended temperatures, while under-baking means the opposite. These terms are also used when talking about the amount of time that the part surface is at curing temperature. Too long can cause over-baking and too little can result in under-baking. Over-baking powder can lead to brittleness, flaking, discoloration (yellowing or browning), and lack of gloss. Under-baking powder can cause excessive orange peel, poor chemical resistance, lack of adhesion, inconsistent gloss, and poor resistance to corrosion. If your powder is exhibiting any of these problems, it may indicate that your oven is getting too hot or not getting hot enough. An oven recorder can help identify if your oven temperature (https://www.reliantfinishingsystems.com/powder-coating-equipment/powder-coating-ovens/) is not reaching the desired range or if there are hot spots or cold spots in the cabin that are impacting your curing results. If the temperature in the oven is not within the necessary range, or it is significantly inconsistent inside the cabin, you’ll end up dealing with curing problems even if they are not immediately detectable. A high quality powder coating oven recorder is the best tool to use when you need to identify those issues. The top red line shows the air temperature probe, which measures the air temperature of the oven at a specific location, usually near the part being tested. At arrow A, the air temperature rises to the 425° F set point (the temperature that the operator wants the oven to reach) and then starts idling at +/- 5 degrees. This consistent discharge of heated air allows the metal temperatures, arrow B, to rise evenly to the desired curing temperature. 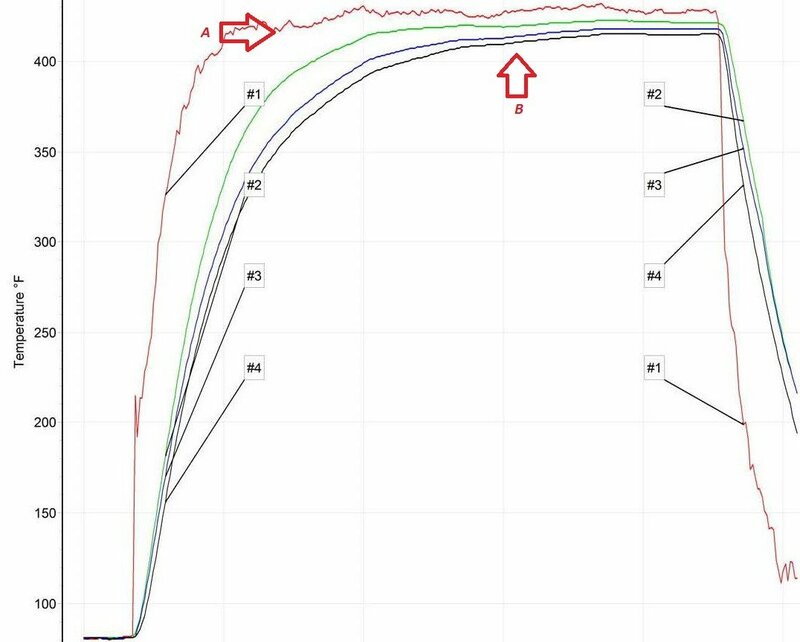 If you notice dips in the air temperature line, these represent potential problems that can hurt your throughput by increasing cure times, and may reduce your overall finish quality. This is because undesired drops in air temperature may decrease the consistency of the surface temperature of the part. The opposite problem, spikes in the air temperature, can be just as bad. Whenever your oven’s heat system overshoots the temperature you want, you’re wasting fuel. You can also end up damaging finishes that require a delicate touch. By not recognizing the way excessive air temps influence your curing cycle, you’re also probably not operating at maximum throughput. Some common causes of poor temperature regulation by the oven’s heat system include bad temp probes (thermocouples), insufficient insulation or insulation that has settled inside panels during shipment or handling, poor air circulation through the oven cabin, improper exhaust ventilation airflow, inadequate ducting, and faulty or outdated controls. In batch operations, employees opening the oven randomly during the curing process to check the parts can dramatically affect the air temperature inside the oven and can lead to improper curing. Obviously, opening the doors lets out hot air but the rapid drop in temperature can also cause the oven’s heat system to go into overdrive getting the temperature back to the desired range. This wastes gas. Once the doors are closed again, the overshoot can cause the oven to overheat because the heat system cannot throttle back quickly enough once the hot air is no longer escaping from the cabin. When testing automatic coating lines, the powder coating oven recorder travels through the oven on the conveyor. 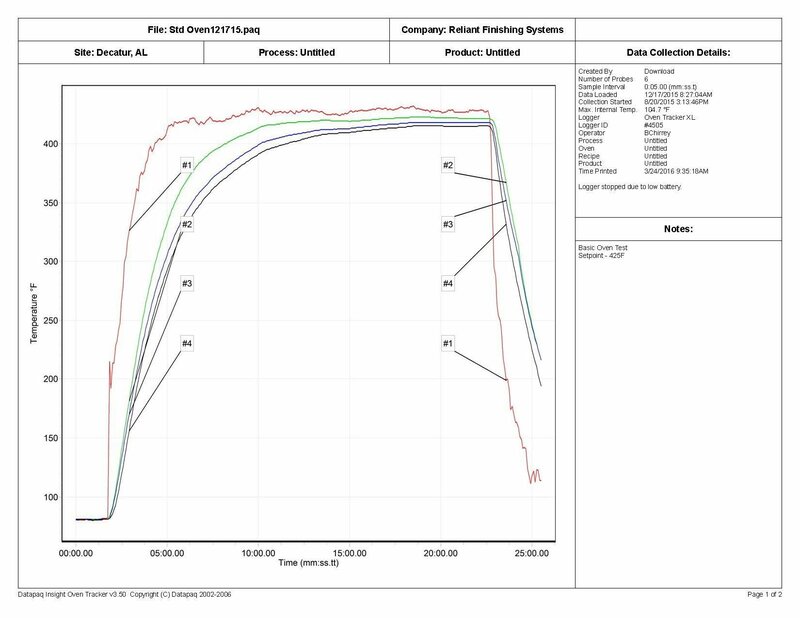 It is not unusual to see temperature fluctuations around oven openings, during direction changes near the ends of multi-pass ovens or when the recorder gets close to the output of the heat system. Adjustments to air distribution baffles, plenum discharge dampers or exhaust intakes are typical when fine-tuning an automated line. Although not in color in this example, the two jagged top lines indicate the air temperatures measured as the recorder moved through the oven. The two smoother lines indicate metal temperatures. You can see how the abrupt drop in air temperature affects the metal temperature graphs. This can extend the dwell time needed in the oven, requiring a lower line speed for proper curing. Left unchanged, this can cause uncured parts to reach packing. A problem of this type with a conveyorized powder coating system may be due to a faulty burner in one of the heat units or perhaps a brief burner shut-down due to a safety switch tripping. The powder coating oven recorder report gives you a couple charts showing the temperatures achieved and the time above these temperatures. The arrow shows the cure time needed for the cure temperature specified. You can get this information from your powder supplier. The times circled are the metal parts’ time above the required curing temperature. Since these times are greater than the specified duration at the curing temperature, the parts should be fully cured when they exit the oven. If they do not reach the specified time at temperature, you’ll probably have to turn up the temperature of your oven or increase the dwell time. Different metal thicknesses will affect your cure temperatures and times. If you are curing thin and thick parts at the same time using the same time/temp combination, you can possibly over-bake the thin parts–causing discoloration or reduction in gloss. Try to batch similar thicknesses of parts whenever possible. It’s also a good idea not to mix aluminum, stainless and mild steel parts if possible because they can have different curing characteristics. Even if you don’t use a data recorder, make sure you check the finishes you are getting with samples of all of your common parts when setting up your oven. Don’t let lack of attention to detail during set-up rob you of future profits. Many powder providers will be glad to run a data recorder through your oven and share the information they discover. This allows them to help you get the best results from their products. It also gives them a chance to justifiably blame bad finishes on faulty or poorly calibrated equipment. Larger production facilities and high-end job shops may have their own data recorders. These are usually stored and operated by finish line managers or facility maintenance technicians. In smaller shops, owners may have to request a line audit from a service company. No matter who runs the data recorder, adjustments to the oven should usually be made by factory-authorized technicians. Shops with large coating lines may have in-house personnel trained to repair and adjust their ovens by the manufacturers or providers. 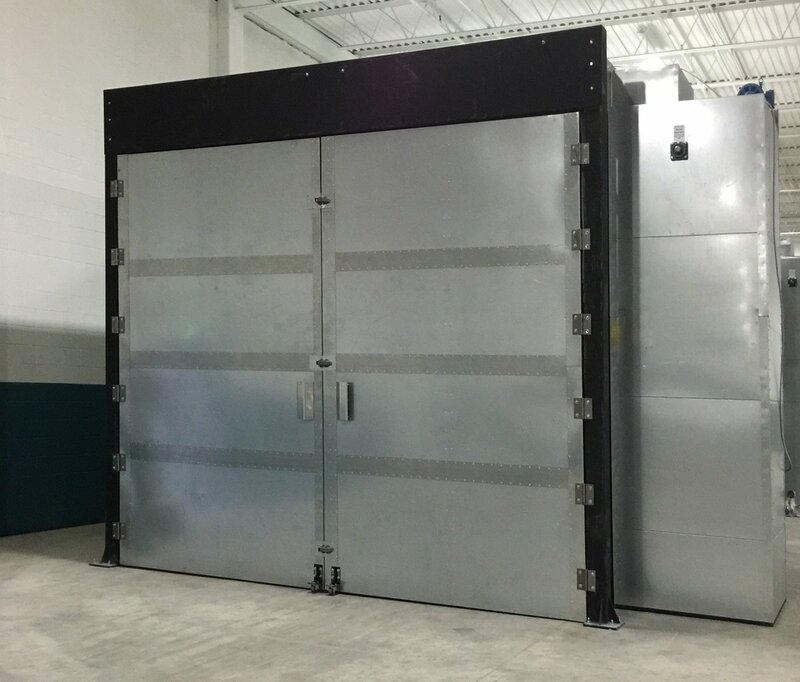 That situation is uncommon, and most powder curing ovens are supported directly by the oven manufacturer, an equipment distributor or a specialized service company. When it comes to tuning your oven, we recommend that (whenever practical) you work with the company that built it. Your powder coating oven should be started and calibrated by an experienced professional. Ideally, you should run some test parts with a data recorder early-on. After you’re in production, it is a good idea to check your oven quarterly or whenever you have a new part with significantly different thicknesses or geometry. A properly cured part is essential for your customers’ long-term satisfaction and will prevent costly returns and reworks. Need your oven checked? Reliant Finishing Systems offers a wide array of services, including oven data recording, technical support, line audits and other troubleshooting services. Give us a call today. This entry was posted in News on April 13, 2016 by Bruce Chirrey.